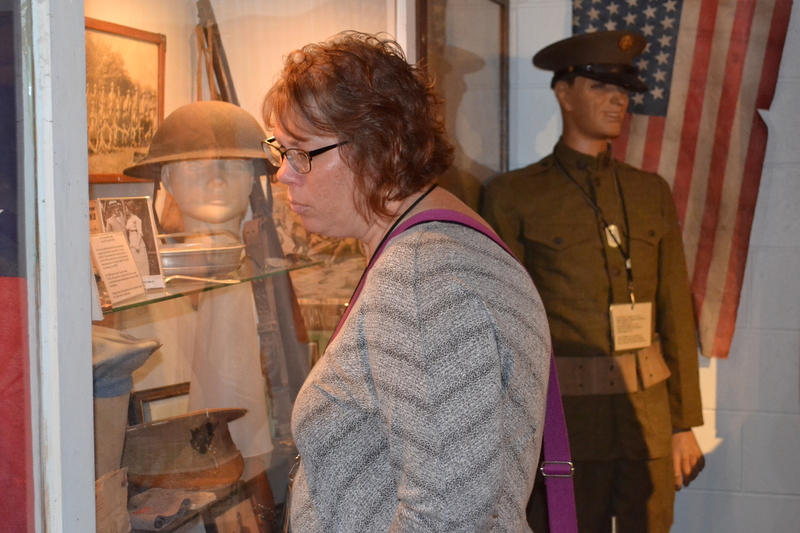 Christy Harpold examines an exhibit of World War I items in the museum at the Chapel in the Park. Beulah Driffel isn’t a well-known figure in Hancock County history. But the story of her short life adds a lot to understanding what life was like in Hancock County in the early years of the 20th century. The Class of 2017-18 heard the tragic story of Beulah’s life and times as part of its tour of historic sites for History Day on Oct. 4. The class visited several key sites throughout the day as part of its study of important people, places and things on the county time line. The story of Beulah was particularly poignant. An exhibit about her is a cornerstone of the collection maintained by the Hancock County Historical Society in the basement museum at the Chapel in the Park in Riley Park in Greenfield. According to Brigette Jones of the historical society, who led a tour of the museum for the class, Beulah was a 6-year-old who contracted diphtheria, a highly contagious illness that often was fatal in her times, the 1920s. The exhibit features items that turned up decades later in a box belonging to the child, including crayons and toys she enjoyed during her short life. The exhibit also focuses on the isolation victims of the infection suffered in that era. A survey of historic structures along U.S. 40, also known as the National Road. The route was the first national highway, and historian Rosalie Richardson, with the assistance of day chair Jeff Butts, took the class of a visual tour of historic buildings along the road. Many of them have fallen into disrepair and cannot be saved, Richardson told the class, which makes this photographic record all the more important. Helen Roney of Tuttle Orchards leads the class on a tour of the family farm. Tuttle’s grows more than 30 varieties of apples. A visit to Tuttle Orchards, one of the oldest — and most well-known — family farms in the county. 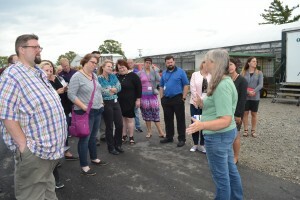 Helen Roney and her daughter, Ruth Ann Roney, who are principals in the farm’s operations, took the class on a tour of the farm, which began modestly a century ago and has grown into a large regional attraction on the agritourism circuit. Class members had the chance to shop in the farm’s store for apples and cider before leaving. A visit to the Riley Home and Museum in Greenfield, which is a staple of any historical tour of the county. Docents Frieda Pettijohn and Phyllis Arthur took the class on a delightful trip into the life and times of James Whitcomb Riley and his family in the mid-19th century. 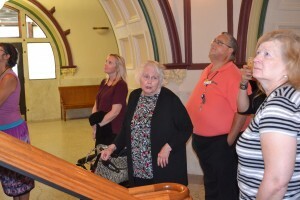 Rosalie Richardson leads a tour of the Hancock County Courthouse. A tour of the Hancock County Courthouse, led by Rosalie Richardson, that wound up in the majestic century-old chambers of Hancock Circuit Court. Judge Terry Snow of Hancock County Superior Court 1, who had wrapped up his day on the bench, joined the class for a discussion about the courts and their historical origins. The class traveled throughout the day via motorcoach. County historian Joe Skvarenina rode with the class and provided rolling commentary about sites the group passed along the way.